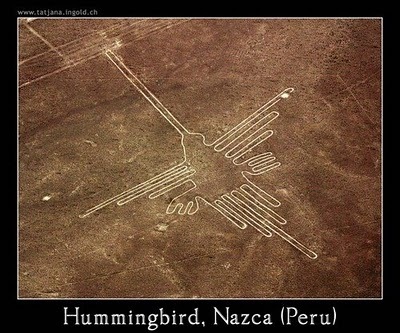 Reprinted below are two posts from 2011 from my blog, Ray’s X-Blog, dealing with the mysterious Nazca Lines in Peru, South America, and how Jim Moseley was apparently the first one to suggest the markings had an ET link. The first post is written by the Supreme Commander himself while the second one follows up on an interesting angle to the discussion. NOTE: For those readers who have stumbled upon this page by itself and are unaware of the life and works of Jim Moseley, the Saucer Smear editor died in November 2012. The contact info mentioned below is invalid. Idiosyncratic takes on the Uncommon and the Unusual. From UFOs to paranormal events to conspiracy theories to anything offbeat that intrigues me. (C) Copyright Ray Palm. Jim Moseley has been around since the early days when UFOs were usually called “flying saucers.” Besides being the author (with Karl Pflock) of the book, Shockingly Close to the Truth! Confessions of a Grave-Robbing Ufologist, he is also the slightly opinionated writer-editor of the world’s longest-running UFO newsletter, Saucer Smear. (Longest running in the sense his newsletter has existed under various names such as Saucer News.) Jim can be reached via snail mail at PO Box 1709, Key West, FL 33041. A donation of two dollars (cash) will get you a copy of his gritty zine. You can (indirectly) contact him via email: saucer_smear@yahoo.com. Please mention Ray X sent you. He enjoys name-droppers. My friend “Ray X” has asked me to write a brief article about my personal experiences with these famous mystery lines on the coastal desert of Peru. In the 1950s I spent a lot of time treasure hunting in Peru, and was quite successful. At that time there was a German archaeologist named Maria Reiche who studied the lines in infinite detail for many years. She wrote an uncopyrighted pamphlet available in English that was on sale in Peru. I edited it to suit myself, and published it under my name in America’s FATE Magazine in 1955. Much later, along came Erich von Daniken and many other sensationalists who jazzed up the story for fun and profit, according to their own fantasies. Now I’ll tell you something of archaeological importance that I have never written about till now for various reasons. 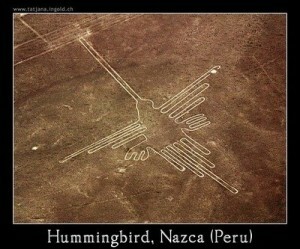 Before I had ever actually seen the lines myself, I was driving one day near Lima with two friends, on a dirt road across a desert very similar to the desert a couple of hundred miles away at Nazca. There, running for perhaps a hundred yards through a tiny valley next to the road, was a line identical in appearance to the ones at Nazca. There may well have been others nearby that we didn’t see. No Nazca pottery, etc., has ever been discovered near Lima, so the conclusion seems to be that other ancient tribes made lines like this for the same reason that the Nazca people did – whatever that reason may be. You may wonder why I didn’t publicize this discovery. Unfortunately, the line was in a little valley almost exactly like hundreds of others, and would be very hard to find again. By now, it is probably under a condo, as the city of Lima has grown tremendously in recent years. The problem here is that Sacsayhuaman consists of huge boulders as heavy as one hundred tons each, piled on top of each other to make walls. Stone can’t be carbon-dated, as far as I know; so no one is able to tell us who built this fortress, when, and how. Even the most modern machinery could not move stones as large as this! 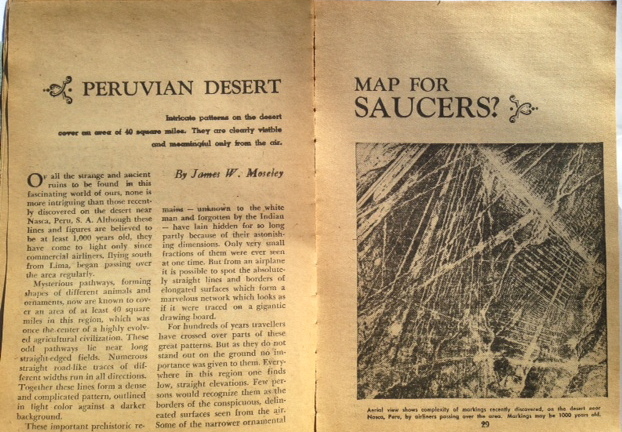 A while ago I was talking telephonically (not telepathically) with Jim, editor of Saucer Smear, about an article he wrote for my blog dealing with the Nazca lines in Peru. Back in the 1950s he visited that area and formulated the theory that the lines were evidence of mankind’s contact with beings beyond this world, a theory he shared in Fate magazine. Recently Jim sent me a copy of a snail mail letter from an online reader, a Curt Collins of Jackson, MS, who did the research, proving that Jim is indeed the first to publicly propose the theory. 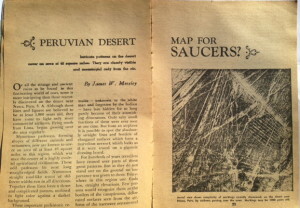 Collins cites an entry from the Skeptic’s Dictionary site that James W. Moseley originated the idea in his article in the October 1955 issue of Fate magazine. Collins mentions that other online citations can be found. As these things work out, Von Daniken took Jim’s idea, ran with it, and made a good chunk of change with books like Chariots of the Gods. But Jim plugs away in relatively obscurity, no bestseller books footing his bills, putting out his UFO zine, Saucer Smear, a labor of love, not money. If you want to compensate for this gross cosmic imbalance, send two dollars (US bills) to James Moseley, PO Box 1709, Key West, FL 33041 for a sample copy of Smear. After all, Jim makes more sense than Von Daniken with 90 per cent less BS.